How does talkSpirit contribute to the digital transformation of an organization with more than 1,000 employees? What were the phases of implementation and the challenges encountered? How did Icade organize the groups on the platform? What are the uses developed through this project? 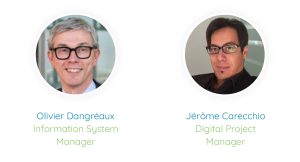 Olivier Dangréaux, Information System Manager and Jérôme Carecchio, Digital Project Manager at Icade, answer these questions. Hello Jérôme, can you introduce yourself and as well as ICADE in a few words? Icade is a real estate investment company, a subsidiary of the Caisse des Dépôts group. We are a major player in territorial development and Greater Paris. We bring comprehensive solutions to build the city of the future. Icade currently has 1,200 employees. I am a digital project manager within the ISD, in charge of issues related to digital matters and of the tools deployed within ICADE. I monitor the implementation and launch of digital devices. Our CIO is currently working on major projects such as the development of employee competence as part of the digital transformation of our company through customized channels, or the dematerialization and storage of a large amount of data. We try to limit development times and costs by relying almost exclusively on SAAS solutions. 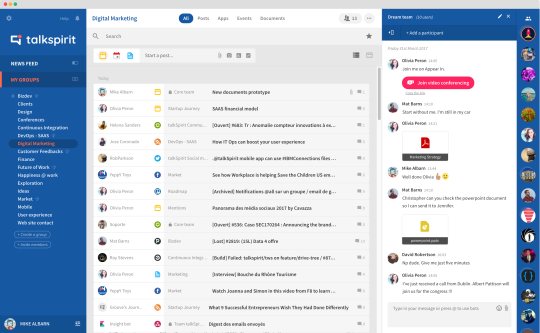 It’s for this reason that we, therefore, rely on market leaders like Box for hosting our files or talkspirit for our corporate social network. How did you function before using talkspirit? We used SharePoint, which was handy for sharing documents, but it wasn’t enough to build discussions around the various shared items. At the same time, we also launched a first social network on the form of a pilot project that wasn’t satisfactory. The solution we used then was less ergonomic and we lacked the ability to interconnect easily with other applications used internally. This is why we have turned to talkspirit, which is recommended for its simplicity of use by consulting firms and especially by its clients who enthusiastically recommend their publisher. How do you manage your in-house communication before setting up talkspirit? Our only means at the time was by email. The email is the old habit which dies hard for most of us. It was to suggest using an alternative to the employees that we decided to launch a corporate social network. Email is not the solution to all our exchanges and it is necessary to introduce ICADE employees to the collaborative tools of the future. What do you think is the difference between talkspirit and other players in the market? We have been working together for several years, and more time passes and more talkspirit becomes increasingly simple and user-friendly. 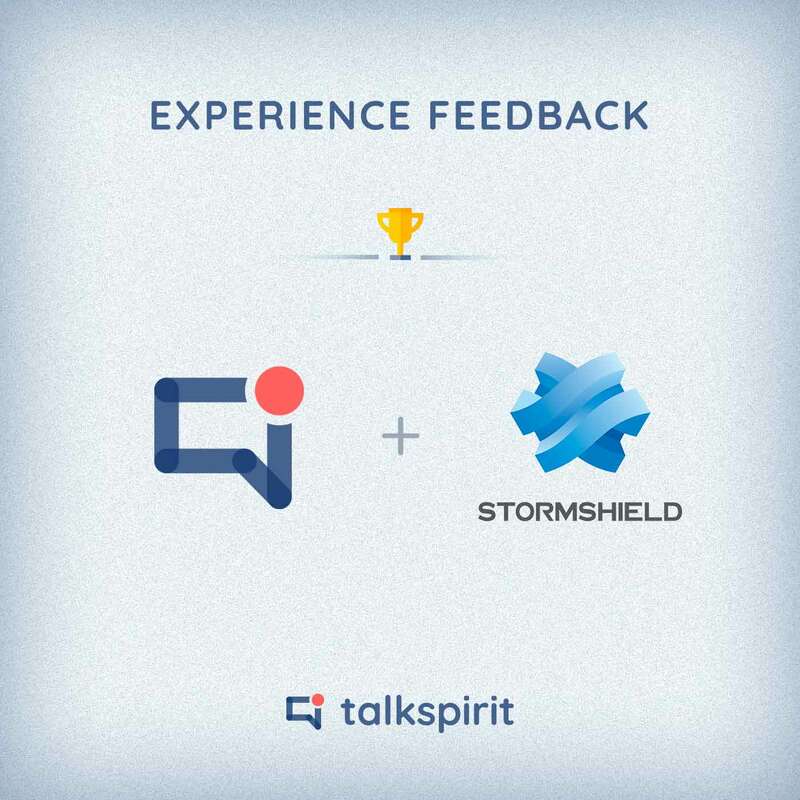 talkspirit focuses on two aspects that are very important to us: having an easy-to-use tool, and providing a pleasant experience for our users. Naturally, the implementation of talkspirit has been facilitated by its ergonomics. Before launching talkspirit, we established a benchmark. The corporate social network market is mature, and there are other powerful tools on the market, but they are much more complex to handle and more expensive as well. What is interesting to note is the ratio between the performance of the tool vs its simplicity of use, in this sense talkspirit is a powerful tool. How was the implementation of talkspirit in your organization? The implementation of a corporate social network is difficult and complex. Our staff wasn’t particularly ready and prepared when tools such as Box and talkspirit were integrated within the organization. In 2016, we began to acculturate our employees by offering them digital programs called “digital campus”, which enabled them to develop skills pertaining to the digital tools available to them. 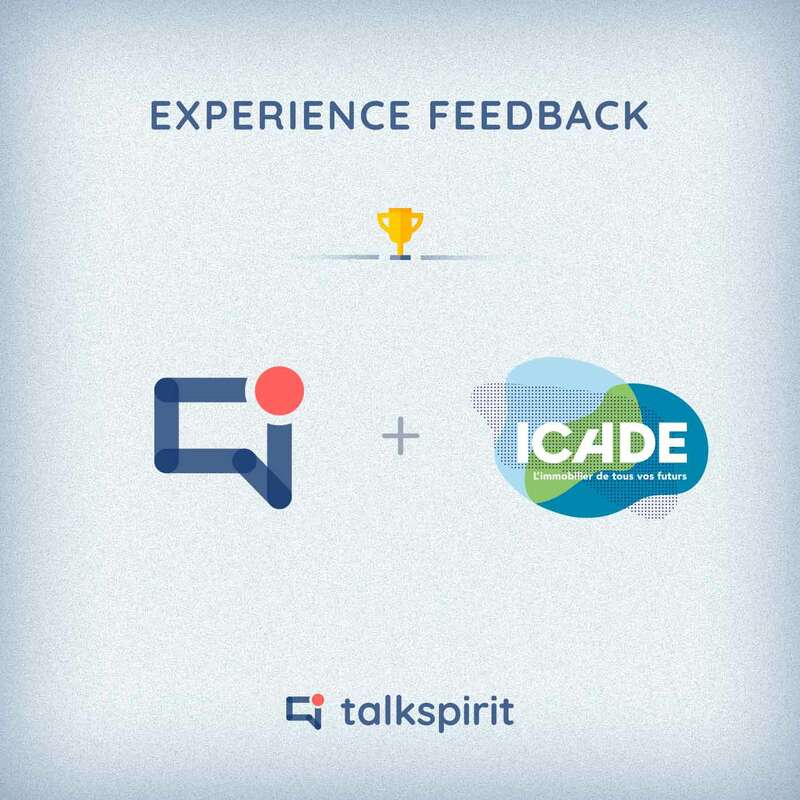 How was the talkspirit app welcomed within ICADE? The implementation of talkspirit came before employees realised their need for it. The tool was quickly adopted by those who needed to use the application. We rely on talkspirit and all the other tools being deployed in the company’s project of digital transformation, and our management relies on the platform to work on the cohesion within our company and to share key information. What were the main difficulties you encountered? We had simple problems during the launch of the project. These included making people connect; finding time to go on the platform; creating the right communities, the ones that make people participate; identifying the “power-users”, those who will push the project ahead; sharing content regularly and animating groups. As in every company, there are a some critics and some proponents of “it was better before”, which, as a matter of principle, are systematically in opposition to these projects and their novelty (it is also normal human behavior!). The most important thing for us at the outset of the project was to rely on those who support the project. For what usage is the platform most frequently used? The project mode is the one that works best on our corporate social network. For these groups it’s important to ensure that all stakeholders participate and that all communication goes through this channel.Communication regarding internal company events. Keeping track of industry news; the integration with Twitter for example allows us to centralise a lot of recent developments. How did you setup talkspirit? On our corporate social network, content is dispatched in groups. For the sake of transparency we categorically didn’t want secret groups. The majority of our groups are therefore open groups. All the thematic groups, watch groups, or concerning extra-professional activities are freely accessible to all employees. We also authorized the creation of groups with limited access so that employees can create forums based on their needs. It’s important that they take ownership of platform. These private groups bring together people who have the same profession or are part of the same team. Our platform currently has 30 groups and more than 2,000 contributions. What are the benefits you get from using talkspirit? Unlike email which is more useful in direct exchanges between two people, talkspirit is relevant to crystallize awareness of a project. Someone who wants to have access to the information pertaining to a specific project can do so even if he or she joins the project along the way (where it is impossible to do by email). From my point of view, talkspirit is an interesting alternative to document storage tools. We use Box – previously SharePoint – to allow for discussions, but only in a limited way. Lastly, talkspirit is an excellent tool to both keep track of industry news – by means of RSS – and share information. From my point of view, talkspirit allows us to structure relevant industry news, just like you would normally structure documents for example. In general, I find the platform very suitable to centralise both relevant information, as well as fruitful discussions. Gone are the days of sharing useless mailing lists. How will you use talkspirit in the future? We want to attract the entire staff in order to make it the reference tool. The usages we have developed so far are good, it is now necessary to make it the only communication hub for all matters pertaining to collaborations, the main communication channel and to increase the participation. Time for the “good practices”. If you could share… What mistakes not to do when starting? What can be counterproductive for the launch of the social network is to register everyone to all the groups. At first, this was our intention but we changed our trajectory along the way. The strength of talkspirit is to allow users to choose content that is relevant to them, and no longer to have to suffer the flow of information that they endure via email. When launching a platform, it’s important to create relevant groups, and not systematically register and notify network members. Do you have another little tip of a successful launch of a network? It is important to instill a sense of belonging of the social network amidst the employees. We quickly made the creation of groups possible, including private groups. Employees were reluctant to have to go through the project management for the creation of a new group. Things have to be spontaneous and control hampers participation. What’s your favourite talkspirit feature? There are plenty of small features that are both useful and enjoyable. If I had to choose three key features, they would be: firstly the mobile application… It’s just great and is a strong selling point. Then, the gallery of images is awesome for everyone. It makes it possible to share images in an only a few clicks in a suitable document viewer. Employees out and about use it in the context of fairs and seminars. Finally, I love the small animated GIFs (laughter) that animates the forum chats. To whom would you recommend talkspirit? I think talkspirit is for any organization that requires strong collaboration. The strength of talkspirit is to that it’s a turnkey tool that embeds the tools already implemented within the different teams. The platform can quickly become the reference tool for internal communication within the company. It’s user-friendly and easily interfaced with a large number of applications. If I were to recommend talkspirit for usage in a particular type of business, I would say that the talkspirit solution can be as well suited for SMEs and to large companies as well, which can benefit from the network due to their work methods and the multiplicity of applications they use.